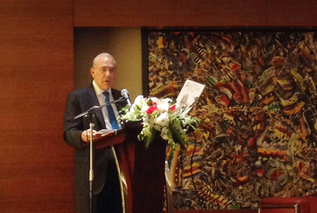 The European Union Chamber of Commerce in China, in partnership with AmCham, the Japanese Chamber and the Business and Industry Advisory Committee (BIAC) China Task Force, organized an exclusive seminar with Angel Gurria, Secretary-General of the Organisation for Economic Cooperation and Development (OECD) in Beijing. Following opening remarks by Jörg Wuttke, Chairman of the BIAC China Task Force and President of the European Chamber of Commerce in China, Mr. Gurria will share his insights on China’s economy and provide details on the OECD’s contribution to China’s 13th Five-year Plan, which will come into force in 2016. Mr. Gurria’s presentation will be followed by a Q&A session moderated by James Zimmerman, Chairman of the American Chamber, and Hiroshi Tokumaru, Representative in China of Mitsui Chemical and Director of Board for CJCCI will provide closing remarks. Ginkgo Search Partners executive search team in Beijing joined the seminar to gain valuable insights into the economic development trends in China.